Phokte Dara in Sikkim is a very special and hidden place. a wonderful panoramic view, a true delight for mountain lover. This place is very special as world’s highest mountain i.e. Mt. Everest & India’s highest i.e.Kanchanganga both are visible at a time from a single spot. Other visible peaks from Phokate dara are Lohtse (world’s 4 th highest), Makalu (5 th ), Nuptse, Chamlang, Three sister’s peak, Chomolonzo etc. Phokte dara offers phenominal views and can be compared to view from Gokyo-ri in Everest base camp trek. This trek is entroute Barsey Rhododendron Sanctuary, providing dense forest trails. 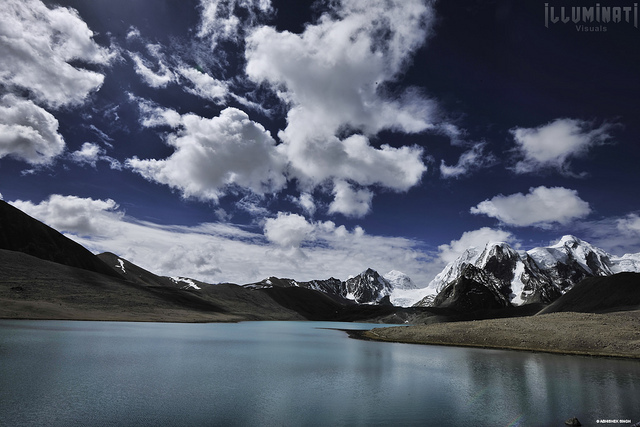 Sikkim the tiny Himalayan state and the best kept secrets of Himalayas. It is castled between Nepal, China, Bhutan and West Bengal and overlooked by Mount Kanchenjunga, the world’s third highest peak. Sikkim is attractive place for holidayers, the adventure sports enthusiast and those interested in Buddhism and Tibetology. Sikkim is paradise for botanist, about 4000 flowering plant species and 600 speicies of Orchid are found in forests of Sikkim. Nearest Airport: Bagdogara (1.5 hour of flight from Delhi) about 11 kms from Silliguiri (124 kms from Gangtok). Sikkim tourism department have started helicopter service from Silliguri to Gangtok. One can reach Bagdogara by flight from Delhi or Kolkata. From here move to Dargeeling and then to Gangtok. Alternately, one can reach Kolkata by flight and catch a train to Siliguri or Siligudi. From Siliguri, Gangtok is 4 hours of drive. Note: Rules keep on changing, hence one needs to check with tourism department and forest department, whether permissions are available for foreigneers to visit these places. With necessary permits and letters one may proceed to this trek. Day one: Kolkata-Silliguri : One can reach early morning in Kolkata by flight. One may choose to take rest or visit places in Kolkatta for sight seeing. In the evening, one can catch train for Siliguri. Travelling overnite is best way to save time and logding expenses. Day two: Siliguri to Gangtok : One can hire a vehicle or bus for a 4 hour journey to Gangtok. These roads are very narrow and scenic. This route would give you first hand view of this himalayan state which is actually smaller than Switzerland in size, but no way smaller in terms of natural beauty. Vast geographical and cultural differences could be found once you move ahead of Siliguri. This strategic town connects mainland India with its north eastern states. About 70% of population in Sikkim speak Nepali. Gangtok is a nice city, situated on the slope of different hills. In India, you always tend to find small tea or coffee shops in roadside. At Gangtok, you would find similar wine shops. Rest of the day one may spend at hotel in Gangtok. Local visits in the town could be done. Flower exhibitions are regularly held in Gangtok. Day five: Hilley – Barsey/Barshey: The route is not well defined and so one needs to start early. Sighting human being on this trail is rare, occassionaly one can find one or two shepherd huts. One has to cut random vegetation to make way. Stopping in between would mean treat for leeches. Local remedy of salt, tobacco and limestone works excellent on leeches. It would be only late evening one would reach Barsey. Barsey is a very nice place situated on top of the hill and surrounded by dense forest. It offers a panoramic view of mountains including Kanchanganga. The temperatures here are often below zero at night. There are two tourist lodges on top providing dormitory. This region is under Barsey Rhododendron Sanctuary located in the south west corner of the West Sikkim district and spreading over 104 sq. km, across the razor sharp Singalila Range, which forms the natural international border with Nepal. In the South the Rambong Khola separates it from West Bengal. Day six: Bersey/Barsey – Jhor Burtey: The leads through the dense forest of Rhododendron, Alpine, Conifer and mixed broadleaf trees. Enroute you would find hundreds of species of flowers and colorful leaves. The entire route is dense and through shades of forest. One has to camp at Jhor Burtney. Day seven: Jhor Burtey – Phokte Dara : One has to keep climbing in the dense forest with a freshness in air more prominent. Midway are some huts of cowmen. By evening one would reach near Phokte dara. One may camp just below the top. Phokte dara is spot on the top of mountain at a walking distance of 30 min. Camping here is wonderful experience, with chilly and clear nights may make this more memorable. Day eight: Phokte Dara – Uttarey : Sunrise in himalayas are very early. First sun ray falling on the snow clad peaks provide a superb view. One may get up early in morning by 0400 am and reach top of Phokte dara. From here a wonderful view of Kanchanganga, Everest, Lhotse, Makalu, Kumbhkarna, Kabru, Japnu and so many peaks. This is truly a fantastic place. But unfortunately there is no mention of it on the trekking or Tourist map of sikkim. Points like Phokte dara are true treasures for a mountain lover. It’s a joy to watch some of the highest peaks of this world from a single point. Phokte dara is situated exactly on the border of India and Nepal. There are few small pillars at this place, if you cross it and stand on other side then it means you are in Nepal. From this spot peaks of Bhutan, China, Nepal and India are visible. Enroute you may find Border security force and may check forest permission and authority letters at Chiba. In the return journey met BSF soldiers unit at Chiba. Chiba camp is located in a picturesque location with snow peaks around. Chiba to Uttarey is a very steep down walk. Uttarey is connected by road and lodging facilities can be obtained here.